The Bachelor of Business Administration (BBA or B.B.A.) is a bachelor’s degree in commerce and business administration. Through BBA courses, students can gain knowledge of business practices and processes, understand the role of economics in the world marketplace, and acquire an awareness of global business issues. A BBA Degree holder can work as Operations manager, Information security officer, Sales manager Loss prevention manager, Cost estimator and many other fields in Bangladesh. So BBA is very popular among the students of Bangladesh. Many Government and Private universities offer BBA course here. Today we will provide you with best universities which offer BBA. 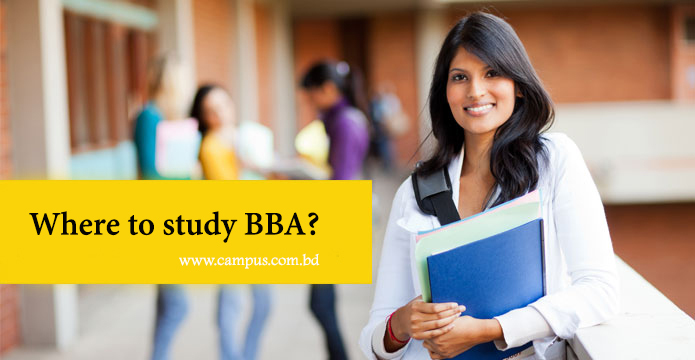 These are comparatively the best universities among all the university that offer BBA here in Bangladesh. Because of their educational facilities, education quality, recent success by their students in different fields and their reputations in recent years, these universities found their places in our list. Thanks to our research team for bringing out the best result for you. NextWhere to study Media and Journalism in Bangladesh?